An exhibition at the Stenersen Museum in Oslo tackles notions of beauty and pleasure as seen by contemporary African artists. From a distance the eight figures that form Nandipha Mntambo’s installation entitled “Silence and Dreams” look like disturbing charred human bodies, limbs missing, and legs slowly but relentlessly melting away. Upon closer inspection, though, the figures reveal a sort of secret beauty as they are actually made of stiffened dark brown and black cowhide and cows’ tails. 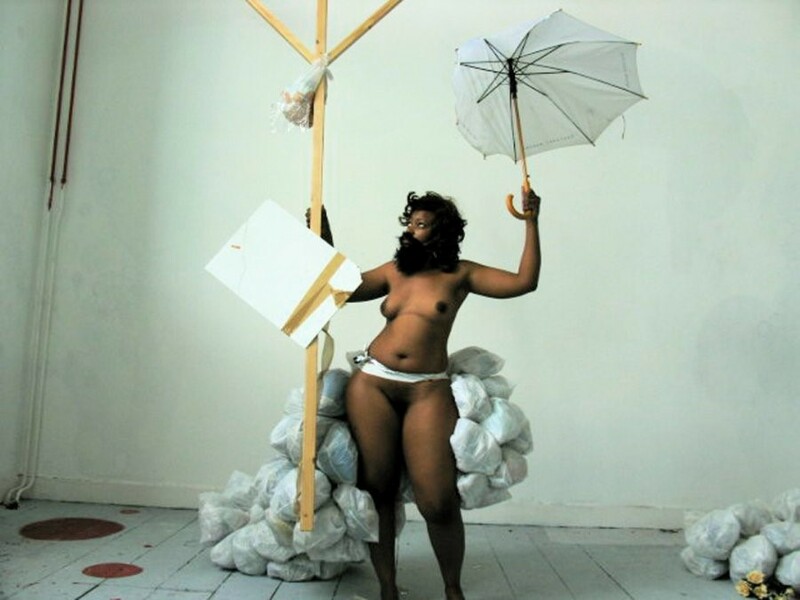 Mntambo’s installation, set to question and challenge stereotypical ideas of femininity and the female form, is just one of the works showcased at the exhibition ”Beauty and Pleasure in South African Contemporary Art” that recently opened at Oslo’s Stenersen Museum. Curated by Selene Wendt, the exhibition tackles the main themes through different forms of art, from photography to videos, from installations to textile works, performance and sculptures. A variety of forms and materials was used to explore the main themes: Kay Hassan favoured recycled objects; Langa Magwa employed wire, metal and wood to build traditional yet modern sculptures, while a few artists used highly tactile materials or visual media to address provocative themes. Lawrence Lamoana analysed for example the influence of the media on society and on shaping people’s psyche with kanga fabric posters that explore the link between the patriarchal structures of South African society and the role of the media in upholding them, while Searle moved from the Afrikaans song ‘Daar Kom die Alibama’ to explore in her video “Alibama” historical and cultural issues. Some works also have a fashion connection: Nicholas Hlobo’s intricate pieces were made using colourful ribbons and organza pieces; Frances Goodman’s sequinned banners in vivid colours with embroidered slogans tackle a variety of themes from fear to violence; Nontsikelelo “Lolo” Veleko used her “Beauty is in the Eye of the Beholder” series of fashion street images portraying Johannesburg youth to explore issues of fashion and identity, while artist, performer, photographer and fashion designer Athi-Patra Ruga analysed through his “craft meditations” socio-cultural themes. Dazed Digital: Can you tell us more about the genesis of the exhibition “Beauty and Pleasure”? Selene Wendt: The exhibition is part of a collaborative project between 5 art institutions in Oslo. Each of us worked together with curators from various regions of Africa on the development of different exhibitions. My exhibition was the result of an extensive research trip to South Africa where I met with Khwezi Gule from The Johannesburg Art Gallery. DD: In which ways do the various artists tackle the notions of beauty and pleasure? SW: Notions of beauty and pleasure are addressed both formally and conceptually in this exhibition. The textiles, works on paper, installations, video and photography included in the exhibition are highly aesthetic, while not limited to the decorative. Overall, these artists have tapped into the power of using notions of beauty and pleasure as a means of conveying deep and often painful underlying issues. DD: Why do you think such themes are not often explored in exhibitions about South African contemporary art? SW: Perhaps because these are issues that were of lesser concern during the days of the anti-apartheid struggle. Today, the post-apartheid attitude demonstrates an open address to the nation’s public and personal engagement with issues relating to sexuality, sensuality, identity, ultimately turning the gaze towards beauty and pleasure. DD: The exhibition features a wide range of artists: was it difficult to select the material? SW: With so much interesting art to choose from, it wasn’t the selection that was difficult, but rather the constraint of having to exclude artists that one otherwise might wish to include. We could easily have included artists from all over Africa for instance, and the rest of the world in fact, but had to adhere to the premise of the exhibition project itself, which was geographically defined. DD: “Beauty and Pleasure” features a wide range of works, from photography to sculpture and textile art, do you think this is the strongest point of this event, the fact that it brings together different artists with different visions? SW: It is always interesting to present a wide range of work that is tied together by a strong underlying theme that ultimately highlights not only the similarities between the artists’ visions but also the differences. DD: Since the exhibition opened what has been the visitors’ feedback and is there one artist among the ones showcased who has been particularly appreciated by the visitors? SW: The feedback has been quite positive, both in the media and among visitors. Naturally, people react differently to the various works, but everyone is raving about Berni Searle’s video installation Alibama and Nandipha Mntambo’s installation Silence and Dreams. DD: Is there a catalogue/book connected with this event? SW: We have published a catalogue with texts by Khwezi Gule and Gabeba Baderoon, as well as a selection of poetry by Mazisi Kunene, and my curatorial text. DD: Will the Stenersen Museum organise in future further events featuring contemporary South African artists? SW: There is so much interesting art in South Africa, so there are many possibilities for future exhibitions. I do foresee including South African artists in a future exhibition project that will not be limited to one particular geographic region or country. “Beauty and Pleasure in South African Contemporary Art” is at the Stenersen Museum, Oslo, Norway, until 10th May 2009.